Distinguished US Scholar Professor Dr. Robert Jensen, from University of Texas will deliver a series of lectures at the International Islamic University, Islamabad (IIUI) in the month of July. He will speak on Media Laws and Ethics for students of the Centre for Media and Communication IIUI. Dr. Jensen will also participate in seminar on Media Law from the international and Pakistani perspective. His lectures started on June 30, 2008. In his first lecture Prof. Jensen discussed the most pressing contemporary issues concerning freedom of expression regarding history of philosophy. The opening session was also addressed by Dean, Faculty of Social Sciences, Dr. Tahir Hijazi, Director Centre for Media and Communication, Dr. Masroor Alam Khan and Head of the Centre Mrs. Rukhsana Aslam. Professor Robert Jenson Texas University, USA addressing the students of the Center for Media and Mass Communication, International Islamic University (IIUI) on Monday June 30th. Da'wah course for Media Producers ends. Ten day Da'wah Course for media producers from all over the country ended here on Thursday. Dr. Anwar Hussain Siddiqui, President, International Islamic University, Islamabad (IIUI) while speaking as chief guest said that world is run by media hostile towards Islam and Muslims. Unfortunately, Muslims have left this area to be utilized by others as per their wishes and designs. Dr. Siddiqui added that Muslims especially Pakistanis are facing severe threats from other hostile entities. So far so very existence of Pakistan is being questioned by vested interests. Now, it is the duty of media persons to be well aware of these nefarious designs and to chalk out a plan to overcome the situation. Dr. Siddiqui asked media persons to use their potentials for the supreme cause safeguarding Islam and Pakistan in a systematic and befitting manner. The IIUI is preparing Muslim generations to shoulder responsibilities of future building with a vision and dedication. The concluding ceremony was also addressed by a number of media producers including Tasneem Aslam and Amjad Hussain Shah from Karachi, and Imran Javed from Bahawalpur. Earlier, Professor Abdul Jabbar Shakir, Director Da'wah Academy, IIUI and Mr. Nasir Farid, Incharge Media, Da'wah Academy presented reports about ten day course. They informed that the Academy would launch similar orientation programmes in other parts of the country as well. The ten day programme was addressed by leading scholars from various parts of the country. 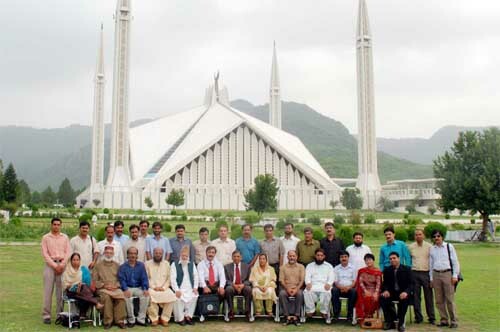 They included Azhar Niaz, Iqbal Ehsan Akbar, Dr. Anis Ahmad, Dr. Imtiaz Zafar, Col. Ashfaq Hussain, Professor Habib ur Rehman, Dr. Ijaz Shafi Gilani, Oriya Maqbool Jan, Wusat Ullah Khan, Prof. Fateh Muhammad Malik, Iftikhar Arif, Naveed Zafar, Dr. Muhammad Al-Ghazali and others. They spoke on Islamic Culture and Civilization, Media Values and Professionalism, outline of Pakistani literature, Cultural Shock, and other related topics. 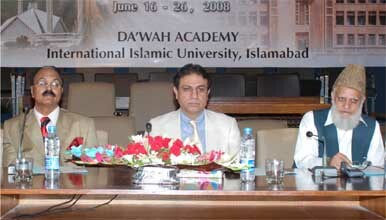 Two Faculty members of the Department of the Mathematics, International Islamic University Islamabad, Drs. Ambareen Afsar and Tariq Javed have successfully completed their Ph.D degree from Quaid-i-Azam University. It is worth mentioning that Dr. Tariq Javed and Dr. Ambreen Afsar have published 12 and 06 research papers respectively in HEC recognized ISI journals during their Ph.D studies. In another development, Prof. Javed Ahsan of the same department has published a book entitled, "A Homological Approach to the Theory of Monoids" of international level. This book is a new addition in Mathematics literature for the research students of pure Mathematics. The first batch consisting of seven students have completed their MS in Mathematics, of these students, two have published their research work in the international journals recognized by HEC. Dr. Rahmat Ellahi Chairman Department of the Mathematics, International Islamic University Islamabad, has published 12 papers in ISI approved journals of HEC in 2007-2008. The details of the papers are given below for the interested researchers. Communication in Nonlinear Science and Numerical Simulations, Vol. 12 (2007), 300-313, USA. Journal of Porous Media, Vol. 10(8) (2007) 797-805, USA. Communication in Nonlinear Science and Numerical Simulations, (online available), 2008 USA. A Memorandum of Understanding for academic cooperation was signed between the Asian Institute of Technology (AIT), Bangkok and the International Islamic University, Islamabad (IIUI) at the New Campus of IIUI. 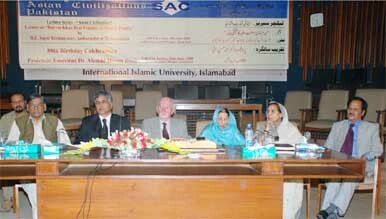 AIT was represented by its President, Professor Said Irandoust and President, IIUI, Dr. Anwar Hussain Siddiqui. The MoU opens ways of cooperation in research and education by the two leading institutions of Asia. Dr. Irandoust in his remarks appreciated role of the International Islamic University, Islamabad in promoting quality education in this part of the world. He expressed his happiness over speedy expansion of the IIUI which has now a student population of over fourteen thousand out of which five thousand are female. Dr. Anwar Hussain Siddiqui in his remarks highlighted the role of engineering and technology for well being of nations. He said that being aware of this fact the university has branched out to contemporary fields of education including engineering, science and technology. He added that the IIUI is planning to have its own medical college with latest and well equipped hospital in near future. Earlier, delegation of AIT headed by Professor, Irandoust called on Dr. Anwar Hussain Siddiqui and discussed about furthering mutual cooperation. Dr. Naveen Anwar, Associate Director of AIT, Dr. Abdul Majeed, Director, Strategic Planning Cell of IIUI were also present on the occasion. The delegation also had meetings with Deans, Chairpersons and senior faculty members of the IIUI. Dr. Anwar Hussain Siddiqui, President, International Islamic University Islamabad (IIUI) talking to a Delegation of Asian Institute of Technology Bangkok Thailand (AIT) led by Prof. Iran Dost on Mutual Cooperation in Academic field. A lecture on Historical role of "Bairam Khan- Real Founder of Mughal Empire" was held at the International Islamic University, Islamabad (IIUI) Sapar Beerdiniyazov Ambassador of Turkmenistan spoke on Importance of Bairam Khan in founding Mughal dynasty which ruled India for a long time. The Mughals were pioneers of the Muslim civilization in the subcontinent which was at that time not only spread over present Indo Pak but Burma was also included in that Empire. Mutee-ur-Rehman Mirza Sr. Vice President Society of Asian Civilizations, Dr. Razia Sultana, its Founder Member and Dr. Anwar Hussain Siddiqui President (IIUI) also spoke on the occasion. They said that Bairam Khan was a visionary who was able to see Mughals role in the Central Asia and even Indo-Pak subcontinent. 88th Birthday Anniversary of Prof. Emeritus Dr. Ahmad Hasan Dani was also held after the lecture.Dr. Eynullah Madad Ali, Ambassador of Azerbaijan, Dr. Ahsan Ali, Vice Chancellor, Hazara University, Dr. Mina Zulfiqar Ali and Miss Farhat Iftikhar Gill, Asstt. Professor National Institute of Pakistan Studies, Quaid-e-Azam University, Islamabad spoke on services and contributions of Dr. Ahmad Hasan Dani. They paid rich tributes to him and termed him as a beacon of light for other scholars not only in Pakistan but in Central Asia and other parts of the world. They added that Dr. Dani is an asset for Muslims. Both the lecture and Birthday anniversary of Dr. Dani were arranged by the society of Asian Civilizations. Dr. Abdul Majeed, a former advisor COMSATS Institute of Information Technology, Islamabad has joined the International Islamic University, Islamabad (IIUI). He is an eminent scientist and researcher associated with the field of scientific research and development, planning and policy formulations for the last thirty years. He is an expert in strategic planning of the academic programmes of the universities. At IIUI, he has joined as Director of the newly established Strategic Planning Cell. The Cell is responsible for planning and development of the futuristic programmes and enhancing international linkages with the foreign universities and institutions in the field of science and technology. Rashid Naushahi, former private secretary to Malik Mairaj Khalid, Former Rector International Islamic University, Islamabad (IIUI), Lawyer and a Columnist passed away here on Tuesday. He was 70. Rashid Naushahi was laid to rest in the Islamabad graveyard in the presence of a large number of IIUI faculty members, Officers, employees, students and members of lawyers community. IIUI Rector Dr. Manzoor Ahmed, President Dr. Anwar Hussain Siddiqui, Director Islamic Research Institute Dr. Zafar Ishaq Ansari and Syed Muzammil Hussain Deputy Director Public Relations of the University have expressed there tributes to late Naushahi. They prayed Allah Almighty to place his soul in eternal peace. Second orientation course for electronic media Producers started here at the International Islamic University Islamabad. The 10-day course has been organized by the Dawah Academy of the University. Yousaf Baig Mirza, Managing Director, Pakistan Television Corporation was the chief guest on the occasion. In his speech, Mr. Mirza highlighted the importance of objectivity in presentation of news and views over radio and TV channels. He said that by advent of private media channels, it is necessary for training organizations to arrange such courses for their producers to fulfill their responsibilities keeping in view our historical, religious and social values. He added that there should be some sort of code of ethics and should be strictly implemented by people concerned with media. Mr. Zakir Muhammad Jauhar, Director, Iqbal International Institute for Research & Dialogue (IRD), and Prof. Abdul Jabbar Shakir, Director Dawah Academy also spoke on the occasion and gave details of the 10-day programme. They were of the view that both the International Islamic University and Dawah Academy shall take every necessary step to prepare media managers for shouldering their responsibilities in accordance with Islamic values and teachings. A large number of producers of electronic media from all over the country are participating in the course. IGIS is a post graduate institute established by NUST in 2003. The prime objective of the Institute is to fulfill the educational needs of public and private sector in geographical information systems and remote sensing, presenting a number of programs from short courses to degree level programs like MS and PhD. MS Program started in 2005. 4th batch will be inducted in July-August 2008. IGIS faculty is skilled second-to-none in conceptual and practical knowledge of geographical information systems and remote sensing technologies. IGIS lab is the state-of-the-art lab equipped with the resources required for GIS and remote sensing data analysis. A Memorandum of understanding for academic co-operation between the faculty of Shariah & law, Maldives, College of Higher Education, Republic of Maldives (FSL, MCHE) and faculty of Shariah & law international Islamic University, Islamabad (FSL, IIUI), was signed here by Dr. Tahir Mansoori, Dean Faculty of Shariah & Law IIUI and Prof Fayyaz Ali Manik, Dean Faculty of Shariah & Law, Maldives. Dr. Anwar Hussain Siddiqui, President International Islamic University, Islamabad was also present on the occasion. According to the MoU Faculty of Shariah & Law, International Islamic University, Islamabad and Faculty of Shariah & Law, Maldives College of Higher Education shall cooperate in academic fields. 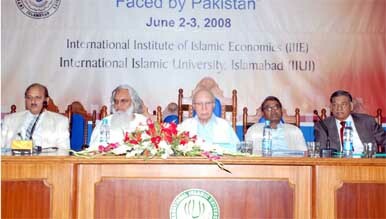 Both the parties shall identify viable areas/subjects of interest for conducting academic programmes and joint research work on specific terms and conditions and involve their research and academic staff to accomplish specific research projects.The IIUI shall nominate its experts in law, Shariah disciplines on the Academic bodies of the second party for expert opinion. The IIUI shall provide its skills and expertise in various academic disciplines related to Shariah & Law, and shall assist the second party in designing schemes of studies, courses, curricula and other academic instructions in the relevant fields of specialization as per requirements of the second party. The IIUI which maintains composing and printing facility, shall make arrangements for the publication of the research work accomplished by both the parties on the principle of cost sharing. Both parties shall have equal copyrights on the research work so accomplished and published. The IIUI being a general University shall offer its academic facilities to the students sponsored by the second party (FSL, MCHE) in regular degree programmes on terms and conditions to be mutually agreed upon. Students sponsored by the second party may join any regular degree programme either as a beginner or as a transfer student in accordance with academic regulations of the first party. The student exchange programme may be offered by both the parties on short term as well as long term basis. Short term exchange programme of students shall be regulated on the principle of credit transfers. The training programmes currently offered by the FSL, IIUI in various fields of law, Shariah and other social sciences shall be made available to the faculty and staff of the second party on mutually agreed terms and conditions in terms of training cost, local hospitality etc. Both parties shall consider deputing faculty members in the disciplines having shortage on either semester basis or session basis as the case may be. While the deputing institutions shall bear the travseling cost (through HEC) of the faculty members so deputed, the host institution shall offer pay and allowances and local hospitality to the deputed faculty. Both parties shall organize periodic seminars, workshops, symposia and conferences for the mutual benefit on each other's campuses on terms and conditions to be mutually agreed upon. The focus of scholarship shall be on Law and Shariah in addition to other areas of interest. FM 90.6 Radio (The Voice of Knowledge) of the International Islamic University Islamabad (IIUI) celebrated its 4th anniversary. 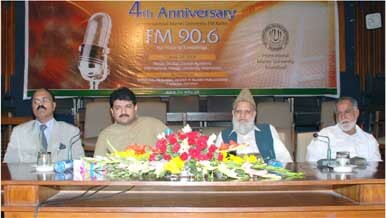 Prominent journalist and TV anchor person Hamid Mir was Chief Guest. Zakir Mohammad Johar, Director Iqbal International Instituate of Research and Dialogue (IRD), Abdul Jabbar Shakir, Director Dawah Academy and a number of others were among speakers on the occasion. Hamid Mir said ours is an age of global media. We are facing tremendous challenges to cope with modern day requirements. He added that both electronic and print media can be bitterly used for projection of cause of Islam which is in fact cause of peace and harmony in the society. Hamid Mir appreciated efforts of IIUI and Dawah Academy for utilization of electronic media for this purpose. Mushahid Hussain, Prof. Khurshid, Dr. Manzoor, Tamara Sonn, Pervez Hoodbhoy, Dr. Anwar Siddiqui, Misbah Saboohi and other Scholars addressed. Dr. Manzoor Ahmed said the problem of Islam and modernism, as a matter of fact, lies in developing a new hermeneutic for understanding the sacred word. It is not only required to understand the sacred but also to understand language used in any universe of discourse. Muslims, in the beginning of the history of Islam, welcomed Greek logic and developed a very systematic doctrinal system. The problem of modernity lies in trying to find out whether certain alternative systems can be built which may not be totally in consonance with the classical deductive system, yet they reflect the true spirit of Islam. The difficulties for Islam do not arise because of any scientific development but because of the changes in perception about social structures and systems. How far the new insight into the nature of social structure can be accommodated within the basic Islamic faith is the question that has to be dealt today. We may have to deviate from the methodology used by our classicists and develop a new logical approach admitting the possibility of plurality of discourse. Such, to my mind, is the problematique of Islam and modernity today. Senator Mushahid Hussain Syed said that it is high time for Muslims to rethink their strategy towards others in the comity of nations. They should not keep blaming others for their own mistake and misfortunes. The Muslims should bear their responsibilities towards creating a peaceful world. Mushahid added that it is true that Muslims are being chased and attacked by their opponents but they should keep in mind that they have to build their own future. Prof. Khurshid Ahmed said that although there are a lot of differences between Muslims and followers of other religions but they is great space for tolerating each other. He was of the view that Muslims should encourage and involve in meaningful dialogue with others in a respectable way. Dr. Anwar Hussain Siddiqui, President International Islamic University, Islamabad (IIUI). Dr. Siddiqui emphasized IIUIs commitment to providing a favourable environment for advancing such scholarly exchange. 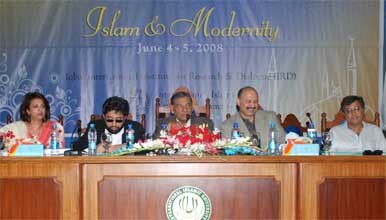 Dr. Mumtaz Ahmed , Executive Director Iqbal International Institute for Research and Dialogue (IRD said the idea of this conference emerged from our dissatisfaction with the current mode of debate on both Islam and modernity, here in Pakistan and the rest of the Islamic world and in the west. Has there been a monolithic Islamic experience and response to what is commonly understood as modernity? Have not there been multiple modernities? If the answer to the first question is No, and the answer to the second question is Yes, then, I believe, it is time to critically reexamine the very nature of the Islam-modernity debate and to understand the ideological-political purposes behind framing the question in this binary and contradictory mode. Ms. Tamara Sonn, Dr. Pervaz Hoodbhoy, Dr. Zafar Ishaq Ansari, Noman-ul-Haq, Dr.Muhammad Farooq Khan, Aasim Sajjid Akhtar, Khaled Ahmed, Salman Sayyid, Misbah Saboohi, Asad Farooq, Suroosh Irfani ,M. Shahid Alam and Dr. Khalid Masud also spoke during the conference. All the speakers stressed upon the need of revisiting actual Islamic teachings which advocate creation of harmony among followers of existing religions in best interest of humanity at large. They said that pure Islamic values have no conflict with any other faith and there was quite good coexistence in past which can be revived. A student delegation from Darul Uloom Chaman Kot Azad Kashmir visited the Old campus of the International Islamic University, Islamabad (IIUI). They were briefed by Syed Muzammil Hussain Deputy Director Public Relations and Nasir Fareed Incharge Media Center, Dawah Academy. They told the delegation that the university was started in 1980 with just 13 students and only one faculty that is Faculty of Shariah & Law. Now the university has a student population of 15 thousand with 9 faculties teaching in all fields of Knowledge except Medical yet. They said that the purpose of the university was to provide quality education in both traditional as well as contemporary systems and requirements. They also asked the Madrassah students to equip themselves with modern day communication methods. Principal of the Darul Uloom Maulana Amjed Abbasi and some students of the Madressah also addressed on the occasion and expressed their keen interest in IIUI activities and congratulated its Rector and President for providing all out guidance to the enrolled students. 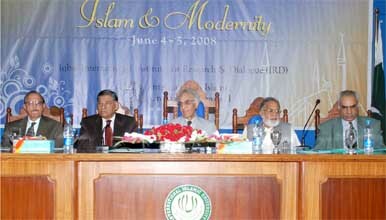 A number of Scholars addressed on First day. Two day International Conference on Islam & Modernity started here on Wednesday at the International Islamic University, Islamabad (IIUI). Dr. Manzoor Ahmad, Rector, IIUI and Chairman, Governing Council, Iqbal International Institute for Research & Dialogue (IRD) made following speech at the inaugural session of the Conference. The opening session was also addressed by Dr. Mumtaz Ahmad, Executive Director of the IRD, Dr. Anwar H. Siddiqui, President, IIUI and Mr. Zakir Muhammad Jauhar, Director, IRD. Dr. Manzoor Ahmed said the problem of Islam and modernism, as a matter of fact, lies in developing a new hermeneutic for understanding the sacred word. It is not only required to understand the sacred but also to understand language used in any universe of discourse. Muslims, in the beginning of the history of Islam, welcomed Greek logic and developed a very systematic doctrinal system. The problem of modernity lies in trying to find out whether certain alternative systems can be built which may not be totally in consonance with the classical deductive system, yet they reflect the true spirit of Islam. The difficulties for Islam do not arise because of any scientific development but because of the changes in perception about social structures and systems. How far the new insight into the nature of social structure can be accommodated within the basic Islamic faith is the question that has to be dealt today. We may have to deviate from the methodology used by our classicists and develop a new logical approach admitting the possibility of plurality of discourse. Such, to my mind, is the problematique of Islam and modernity today. Iqbal Institute has been established to develop a system of understanding different paradigms available in the modern world. We shall do it by exchanging ideas, by interacting with each other, and by trying to understand that every culture and every religion has a right to exist in the modern world in an amiable fashion. The two day National Conference on Economic Challenges Faced by Pakistan arranged by the International Islamic University, Islamabad (IIUI) Concluded here. Former Federal Minister for Education Ahsan Iqbal was Chief Guest in the concluding session. He said that Pakistan is faced by tremendous problems summarized in 3 Es that is Education, Energy and Enterprise. He was of the view that continuous dictatorship has harmed the country a lot. He also advocated early construction of small, Medium and Large size dams to get rid of present Energy crisis. About Education he said that it should be linked with industry to cater its requirements.Dr. Anwar Husssain Siddiqui, President International Islamic University, Islamabd (IIUI) was also present on the occasion. He announced that the university has realized this need of the hour and for that it has devised long term policies. 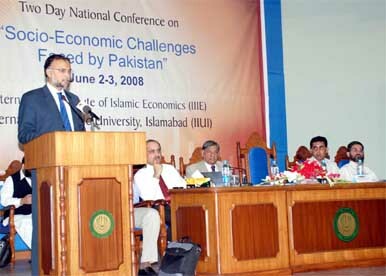 Leading economists and scholars presented papers and delivered lectures on various aspects of the economy of Pakistan. The economists and scholars who spoke on the second day of the conference included Dr. G. M. Arif Dean Faculty of Development Studies Pakistan Institute of Development Economics, (Islamabad) on "infrastructure and poverty nexus: the case of Rural Pakistan", Mr. Muhammad Naveed Iftikhar Research Associate Ministry of Finance, (Islamabad) on "Economic reforms, WTO and export competitiveness: A case study of Pakistan", Ali salman, Economist and entrepreneur & Jawad Aslam, Activist and Entrepreneur, Saiban-NGO (Lahore) on "property Rights: Ensuring well being through low income housing". In the second session on the same day speakers to include Dr. Ather Maqsood Ahmed Member (Fiscal research & Statistics) federal Board of Revenue (Islamabad) on a "critical appraisal of taxation Reforms in Pakistan: challenges and future prospects", Dr. Mumtaz Anwar, Assistant professor (Economics) University of the Punjab, (Lahore) on "fiscal imbalances and inflation: A cases study of Pakistan", Dr. Shahid Hasan Siddiqui, research institute of Islamic Banking & Finance (Karachi) on "performance of banking sector in Pakistan". In the third session on same day speakers to include Dr. Abdul Salam, Professor of Economics, Federal Urdu University of Science & Technology, (Islamabad) on "food security, current situation, challenges and opportunities", Dr. Abid A. Burki, Professor of Economics and Dr. Mushtaq Ahmed Khan, Associate Professor of Economics, LUMS (Lahore) on "Price support and wheat market policy in Pakistan: Futuristic of Food security", Saima Ayaz, Zakir Hussain, Sofia Anwer and waqar akram, University of Sargodha, (Sargodha) on "producers and consumer subsidy equivalents of wheat crop in Pakistan". In the fourth session on the same day speakers to include Dr. Syed Tahir Hijazi, Dean Faculty of Social sciences, IIUI on "Pakistan Current Energy problems", Javed Anwar Lecturer, IIIE, IIUI (Islamabad) on "Energy security and the developing country: Issues, strategies and options", Dr. G.M Arif presented the issue of infrastructure and poverty Nexus: The Case of rural Pakistan. He said that the absence of physical and social infrastructure and lack investment in human capital are the main causes of poverty in many areas. 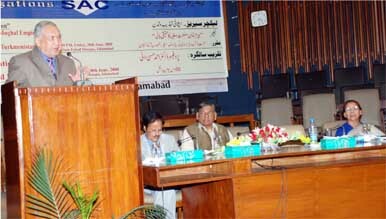 Mr. Naveed Iftikhar, Spoke on economic reforms, WTO and export competitiveness: A Case of Pakistan. He mentioned the economic reforms introduced in Pakistan which include reduction in tariff rates, autonomy of state bank of Pakistan and securities and exchange commission and privatization of public owned institutions. He suggested that to improve our exports we should reform our support institutions, try to diversify our exports and improve the quality to gain competitiveness in the world market. Ali Salman spoke on property rights: ensuring well being through low income housing. He presented picture of housing needs in Pakistan especially in the middle class. He estimated that the potential demand for low cost housing is around US $ 15 billion. Dr. Ather Maqsood Ahmed, Member Federal Board of Revenue of Islamabad Presented a critical appraisal of taxation reforms in Pakistan. He said that besides being simple and fair, the taxation system should be growth promoting by enabling flow of domestic and foreign saving towards productive investment. Since such a system cannot be sustained, a change is absolutely inevitable. Dr. Shahid Hassan Siddiqui, Chairman, research INtitute of Islamic Banking and finance, Karachi presented a brief account of performance of banking sector: impact and Pakistan's Economy. He said that this is an alarming situation that resources are being transferred from poor to the rich on the one hand and leaving harmful impact on the economy on the other. He also recommended appointment of a commission to thoroughly examine various malpractices/mismanagement of resources, particularly since 1997, to arrive at the root cause, at the same time to save from repeating the same experience. Ayesha Serfraz and Mumtaz Anwar jointly spoke on fiscal imbalances and inflation: A case study of Pakistan. They take stock of history and states varying trends in inflation. Dr. Zubair said that the major macroeconomic indicators relating to monetary and fiscal measures have not been aligned to achieve the viable results. He was particular to the influx of funds consequent to 9/11 which could not be productively utilized. He pointed that high tax/GDP ratio in developed counties was result of volunteer-ship indicative of people's confidence upon their governments with respect to utilization of such resources. Finally, he was conclusive of the fact that the poor were sharing the tax burden of the rich people in Pakistan's case which needed appropriate reforms. Dr. Abid A. Burki and Dr. Mushtaq Ahmed khan spoke on impact of higher wheat prices on poverty in Pakistan futuristic of food security, Dr. Abdul Salam on current situation, challenges and opportunities and Saima Ayaz, Dr. Zakir Hussain, Dr. Sofia Anwar and Dr. Waqar Akram on producers and consumer subsidy equivalents of wheat crop in Pakistan. Other Speakers touched upon other basic issues faced by Pakistani economy. Here are some glimpses and highlights of speeches made during the conference. Sales Tax on manufactured goods must be lowered as the imports are facing lower tax rate as compared to domestic manufactured which are facing higher sales tax thus a level playing field is provided to the domestic products. New methods to impose sales tax on retail trade services must be introduced. For example levying taxes o the basis of square feet area of the business premises must be introduced so that competition to manufacturing sector can be reduced. The average import duty has been brought down to even below that what is required by WTO regulation and has contributed to domestic industry loosing market share within the country. This duty must be increased to at least 5% point. Another policy that can be adopted to increase the competitiveness of the manufacturing sector is to impose the import restrictions on the luxury items. It will though reduce the import revenue but it will serve to rein the rate of growth of the trade deficit. Under invoicing of imports is a serious problem to domestic industry. A measure equivalent to the concept of the "right of first purchase" may be helpful. This can be done by placing the invoice of arriving goods consignment on the web site and entitle any party within a 3 to 5 working days period to purchase the consignment by paying say a minimum 25% premium. The capital gain tax must be introduced. This tax may be exempted if the shares have been held for a period of at least 6 months. This measure will reduce profitability compared to manufacturing sector. There has been lot of profitability in buying and selling of land. This has discouraged investment in manufacturing sector as the profitability is low in the sector. To reduce the profitability in land business, consideration may be given to completing the process of computerization of land records and to introduce the concept of right of first purchase to enable the government to purchase any property for sale at a premium of say 20 to 25%. It will curb speculating trading in land thus lowering the profitability in this business. Luxury housing competes with manufacturing for investment funds. A tax on luxury housing will raise its cost thus by raising the relative profitability of manufacturing sector. The sectors which are enjoying the windfall gains like oil & banking may be subject to high taxes. This will not only raise the revenue to the exchequer but also increase the relative profitability in manufacturing sector. Gas prices to domestic users and to industrial users must be the same, if not higher for the domestic consumers. Net resource flows to the public sector both from abroad and domestic private sector tend to crowd out savings in the public sector. Private savings are crowded out by net foreign resource flows to the private sector. The perception that Pakistan has reached the current state because most of its borrowing is used for consumption rather than development activity does not find support from the data. The shrinking of development activity in Pakistan during the 1990s was the result of shrinking foreign resource flow and rising debt servicing cost. Although there are many instances of misappropriation of public resources, unfortunately such instances somehow overshadow the positive side. Pakistan is a unique country in the sense that it has achieved respectable economic growth despite poor social indicators such as education and health. Foreign aid has played a positive role in its economic growth as is evident from high GDP growth figures during the 1960s, early 1980s and mid 2000s. During the 1960s, Pakistan borrowed at ease because it was a newly born country, had ambitious development plans and above all had no immediate pressure of debt servicing. The debt position in the 1980s remained mostly under control due to generous American aid as a reward for Pakistan's logistic support in the Afghan war against the then Soviet Union. The debt crisis of the 1990s got reversed because of the events that unfolded after the September 11 event, especially Pakistan's active role in the fight against terrorism. The major economic hurdle for Pakistan to come out of the crisis was its inability to service the outstanding debt and the drying-up of net resource inflow from abroad, in addition to shrinking foreign investment and workers' remittances. Although institutional weaknesses, public sector inefficiency and corruption cannot be ignored, these have to be addressed in the overall context of management in public sector rather than economic management alone, let alone debt management. Poor record of debt management in Pakistan is the outcome of weak institutions and addressing this issue has to become a larger objective. Domestic borrowing in Pakistan is mostly from individual lenders or financial institutions that lend voluntarily in return for high interest rates and are not organized to impose preconditions for lending. On the other hand, most of foreign borrowing is directly or indirectly linked to international institutions and their motive for lending is not interest earning. In order to justify further lending, Pakistan has to satisfy the lenders that the borrowed funds are used productively. There are two objectives of the monetary policy, Economic growth and price stability. To achieve these objectives central bank has two targets, real GDP growth and controlling the inflation. It is shown that most of the time monetary authorities have not been successful in achieving the target inflation rate. It is also shown that there is an intermediate target to achieve inflation which is broadly defined money supply. Historically, monetary authorities have been relatively more successful in achieving target money growth broadly defined. There should be coordination between SBP and Federal Government to use fiscal and monetary policy effectively. The National Conference on Socio-Economic Challenges faced by Pakistan started here at the International Institute of Islamic Economics ((IIIE) an offshoot of the International Islamic University, Islamabad (IIUI). Prominent economists and social scientists are participating in the conference. Speaking at the inaugural session of the conference Dr. Manzoor Ahmed, Rector International Islamic University, Islamabad (IIUI) said: we have to come up with solid and feasible solutions to the intense problems that our society is facing today. There is no excuse and we can find no way to escape. Such conference work in an effective way of dialogue and exchange of ideas and surely this conference will end up with some thing meaningful for the policy makers and for the relief of poor masses. Sartaj Aziz former Minister Finance said that there is no problem on the policy-making said; the problem lies there on the implementation phase at the government functionaries. How to reconcile the conflicting objectives is the primary job of the economists. The coalition government have to provide meaningful relief to the poor, provide fiscal space in the budget by cutting down un-necessary expenditure. The government has to control the fiscal deficit, check the luxury imports and plan for a structural change. We have to develop proper institutions, based on the customs and traditions of the society and responsible for implementation of public policies in the best interest of the people. No policy can succeed without the support and feedback of the relevant institutions. 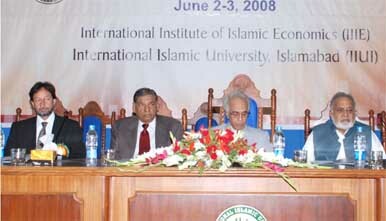 Dr. Pervez Tahir, holding the Mehboobul Haq Chair and Professor of Economics at the Govt. College University Lahore elaborated on the Macroeconomic Fundamentalism. He presented the past history of economic planning in Pakistan and showed that the results are not encouraging. Poverty is increasing overtime and inequalities widening. He emphasized on a programme of development with meaningful relief for the poor and have-nots, failing which the democratic governments cannot survive. Dr. Arshad Zaman, ex-economist of the planning division Islamabad called for a need of restoring the confidence of the people and markets, working hard for financial stability particularly the external finance and for rationalization of the non-development government expenditure. There is no short cut way to resolve the issue with a single blow. The long route is safe and stable, however it demands patience and continuity. Dr. M. Rafique Khan of the Lahore School of Economics focused on resolving the macroeconomic problems by searching foe the missing link embedded in the microeconomic foundations. In order to overcome the energy crisis and to control pollution, it is possible and appropriate to find solution in terms of the bio-gas generation and incineration of the solid wastes and pollutants. The scheme is feasible but it has been set aside by the people working in the decision making capacity. Dr. Anwar Hussain Siddiqui, President IIUI and leading economists including Dr. Kaiser Bangali, Dr. Eatzaz Ahmad, Dr. Abdul Qayyum, Dr. Saboor Ghayur, Dr. Muhammad Aslam Chaudhary and Mr. Javed Iqbal also addressed in various sessions of the first day of the national conference. On the second day of the conference on June 03, the economists shall focus on Poverty, Housing and economic reforms, Fiscal and monetary policy, Food Security and Energy Crisis faced by Pakistan. ©2003 - 2008 International Islamic University, Islamabad, Pakistan.